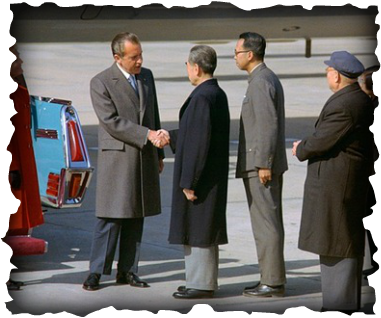 On February 21, 1972, President Richard M. Nixon arrived in China for an official trip. He was the first U.S. president to visit the People's Republic of China since it was established in 1949. This was an important event because the U.S. was seeking to improve relations with a Communist country during the Cold War. 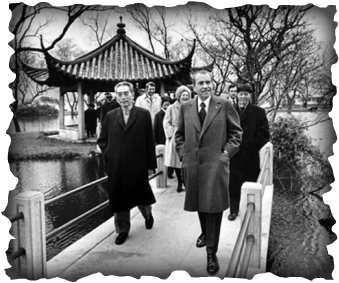 On his visit to China, Nixon met with Chinese Premier ZhouZnlai. The two leaders agreed to expand cultural contacts between their two nation. The Watergate scandal was a political scandal that occurred in the United States in the 1970s as a result of the June 1972 break-in at the Democratic National Committee headquarters at the Watergate office complex in Washington, D.C. The scandal resulted in the indictment, trial, conviction and incarceration of 43 people, including dozens of top Nixon administration officials. Members of Nixon’s Committee to Re-Elect broke into the Democratic National Committee’s Watergate headquarters, stole copies of top-secret documents and bugged the office’s phones. The wiretaps failed to work properly, however, so on June 17 the group returned to the Watergate building. 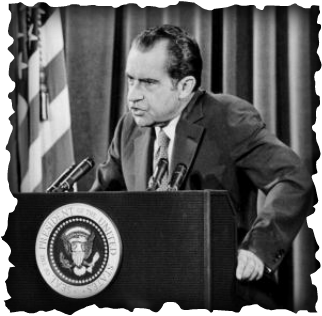 Finally, on August 5, Nixon released the tapes, which provided undeniable evidence of his complicity in the Watergate crimes. In the face of certain impeachment by the Senate, the president resigned on August 8.